The Amish smoke alarm issue has been ongoing for a number of years in New York state. David Belton, who made the PBS Amish documentary, has written an article on the topic for BBC. Swartzentruber Amish in northern New York have violated building codes by not installing smoke alarms in their homes, leading to fines and court cases. The core of the objection appears similar to that towards the SMV safety triangle. Belton speaks with Mose Miller, a Swartzentruber father of 9. The comments he quotes seems to reveal just how offensive the technology is: “I don’t need a devil on the wall to tell me if my house is burning” explains the Amishman. Maybe nuance got lost somewhere, but this quote implies the speaker views alarms as categorically evil–not just neutral but having the potential to lead to evil (as many Amish might view phones or cars). That’s a pretty big difference and reminded me of the comments of one fairly progressive Amish acquaintance, that in some sense his own plain-dressing, buggy-driving Amish clan was actually closer to the English than to the Swartzentrubers. “If God does not wake us, well, that must be part of his plan,” Mose explains, echoing what objectors to the SMV insignia often say. While I agree it is their choice, I wouldn’t have a house (mobile home which we have) a smoke alarm. Mobile homes can go up in a short time. So we have one at each end of our mobile home. I know two Amish men from the Conewango settlement, they grow up together, went to the same school house and have very different views on smoke alarms. One moved to Angelica and is in a drawn out battle with the building inspector over size of the windows in newly built bed rooms and smoke alarms. The other moved to Clyde/North Rose and put in a smoke alarm and as soon has the inspector left he throw it away. They may look the same, but they are not the same. Fatalism is not a part of Anabaptist core theology. Some might liken this behavior to “testing” God. Remember when Satan was tempting Jesus, he suggested that, in order to prove God’s sovereignity, he cast him self down from the high pinnacle of the temple, and if God willed, He would save Jesus? Jesus chose to take care of the body that His Father had given Him. AFTER A DEADLY FIRE THAT KILLED TWO SMALL CHILDREN BECAUSE OF A KEROSENE LAMP FIRE I BOUGHT FIRE EXTINGUISHERS FOR EACH AMISH HOUSE IN MY AREA. I AM DOING A TEST OF 10 YEAR DETECTORS. SO FAR COOKING SETS THEM OFF. THEY ARE NEEDED IN SLEEPING AREAS. And yet they have alarm clocks and tea kettles that whistle……probably a timer on their stove also. Do the infants sleep in a crib? Do the cows have a fence to keep them in? 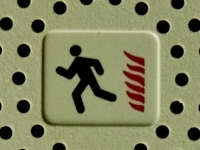 Smoke alarms are not evil, they are just to alert people–because no one is God and cannot know everything. To many people sleep through a fire. The smoke gets to them and kills them in their sleep. Having a smoke alarm would get them out of the house quicker and save many lives. To many times the Amish have lost lives in fires, cause they couldn’t get out in time. Makes more sense to have the alarms than not to have them. People here have suggested to the Amish families that they install smoke alarms for the inspector and then pull them out when he leaves. There are English families here who could loan them the uninstalled smoke alarms that have been sitting on the table in their front hall since they used them to fool the inspector five years ago. But the Amish families say that pretending to install smoke alarms is dishonest. I had smoke/carbon monoxide alarms hardwired in my house to comply with building code. Since smoke alarms were invented I have never known anyone who was saved from a fire by one so I can’t attest to how effective they are but I can tell you why some people don’t install them. In spite of being professionally installed, mine go off frequently for absolutely no reason whatsoever, at all hours of the day and night, like the boy who cried wolf. Please be aware that only a small percentage of Amish would not install a smoke alarm. We have had alarms for many years and would not want to be without and I know of no one who would be opposed to having them. Good comment, Mary. I was not even aware there were Amish people who had issues with alarms until it got on the news & we have a few Swartzentruber relatives, neighbors, & friends. As for me and my house — we have alarms. You beat me to it Lisa, I was going to post that tale! I do like Lattice’s comment above as well — of taking care of the body given you. As far as I know, smoke detectors (and often CO detectors) are only required to be present at the time an original certificate of occupancy is issued or at the time the house is sold. The issue of window sizes is perhaps a clearer issue — retrofitting their size afterwards is a pretty big project, and it’s more likely someone would overlook that item unless they’re really small. The minimum size is set by building codes to allow them to be used as a second means of escape / rescue. Part of the purpose of enforcing building codes is not only the protection of the current owners, but since most houses outlast their builder by several generations or more…to protect those who may buy the house in the future. It makes buildings built today safer going forward (of course “safer” is relative; many of today’s techniques and materials will fail very quickly in a fire or if not maintained compared to old fashion heavy boards and beams…people will evacuate easier with today’s codes, but the underlying construction tends to fail sooner and be less easy to repair). Another trade-off that may seem safer on the surface but may not be in the situation. Thanks for sharing your knowledge here. Lisa, you read my mind to a “T”. This was the exact thought I was going to add but now I’ll just second your statement. Leave it to the Amish, let them decide what’s right for their home. Remember the movie Devil’s Playground? The Amish see the world as that, the devil’s playground, his world. To many Amish, that which comes from that world are things from the devil. Not all Amish have this attitude and it would be more prevalent in the more conservative groups. To those that see it that way, it is much more powerful in their lives than you can even imagine. Safety and safety devices have no chance of penetrating that belief system. Nor can it be forced upon them by law or reasoning. As a whole, these Amish cannot be changed easily from the outside, and internal change is resisted too. It is somewhat fascinating, somewhat irritating to see the contrast in responses to Erik’s posts of conservative Amish. Pictures of Ethridge and Harmony, etc. get comments marveling at the beauty of the farms and how that is what people think Amish should be. Then, we see a post such as this one and others, from which we learn what these people believe and we get comments about how unreasonable they are, that they are tempting, testing or mocking God, and/or that they must reconsider because we love them. It is also interesting to see how many people want them to be allowed live their way. Seems to me about 99% of us love to see the Amish, in their element, but when we find out what they believe, only about 10% want them to stay that way! Appreciate your clear appraisal of comments. Somehow I really get the conservative Amish mind-set of God being in control of everything. Hard for most to accept, including myself. Interesting point Lance. One people can contain elements both extremely attractive and unattractive to outside observers. And ironically I think some of these aspects depend on one another to exist. Even though I realize that Amish men are the head of the house, do they also decide even safety issues? His wife, the mother of his children has no say in keeping her children safe?Could refusing to have a smoke alarm ever lead to criminal charges? Not the fact that there is none, just that the father refused to install one, knowing that this action could lead to the deaths of his family. Yes Lois, the men have the final say in every decision. Some consult their wives more than others, but none can put a detector in the home if the Ordnung forbids it. No, there would never be criminal charges by anyone in good standing with the church. On another note, I might suggest that if the moves, church splits, and differences in Ordnungs are any indicator, there are a good number of Amish that don’t want things to stay the way they are, either. Criminal charges for no smoke alarms? The criminal charges question is an interesting one which has implications not just for any group of Amish but society at large in the context of the nanny state. I don’t think there would be grounds for that as things stand now but some years in the future who knows? I think the answer would reflect to some degree what society deems as acceptable. In my opinion criminal charges in the case of a fire would definitely be a step too far (you could take that to any manner of extremes–child bumps head on corner of kitchen counter, experiences serious injury, parents get criminal charges for not having the proper child safety rubber corners in place…or–you didn’t use the highest grade anti-flammable materials in building the child’s room thus we charge you for negligence; child wasn’t wearing helmet on monkey bars; etc). I think currently the majority of society would reject that idea but if personal freedoms erode over time there may be a point where yes parents do face criminal charges for a vast range of so-called negligent behaviors. "A Speck in the Sand..."
I agree that criminal charges in this case seem somewhat irrelevant – you’d think that perishing in a fire would carry its own punishment! I get the feeling that this is basically another case of the Amish trying to assert their unique identity in the face of encroaching ‘English’ legislation. Surely, even the most conservative Amish must appreciate that a smoke alarm is a useful thing, and not an admission of defeat. If indeed our lives are just tiny specks in the sand, shouldn’t we try to take care of ourselves, and our loved ones, as best we can? They don’t have electricity to start a fire but they do have fireplaces etc. How about a battery operated smoke alarm??? Joey I think batteries is not so much the issue as is the implications of relying on the device for safety. To my knowledge Swartzentruber Amish do use batteries in limited ways. I like Lisa’s story. How many times have we heard that God works in mysterious ways? Actually, there is more to the Amish smoke alarm issue in St. Lawrence County, NY. In Morristown, NY, the town code inspector who began to enforce the smoke alarm issue was also “outed” as being the author of seveal anti-Amish messages on an anti-Amish website. The case attracted the attention of one of major religious freedom law firms. I’ve posted a link below; not sure if the cases are one and the same or two different communities. Installing a smoke alarm as an insurance to avoid being burnt alive in one’s home in case of a fire is a slippery slope to hell as far as the Amish are concerned. Next step down the line is medical insurance in case one is in an accident, life insurance in case one dies and leaves loved ones unprovided for, home insurance in case of whatever, personal insurance in case of whomever, barn/livestock/crop/buggy insurance in case of whichever, however, whenever, etc. Where does one draw the line? The Amish have forbidden insurance in general and smoke alarms fall under that ban. The issue here is not smoke detectors. It is an issue of religious liberty and even more so of individual liberty, religious belief not withstanding. Every person should be allowed to live on their land as they choose, as long as their actions do not harm others. Sure, insurance companies and mortgage companies and banks have every right to put restrictions on homeowners, because they have a vested interest in the home. But government laws and codes that restrict personal liberty, (where others are not directly impacted by my actions), are morally wrong.